Our Treasure Garden AKZ Cantilever 11' Octagon Tilt Patio Aluminum Umbrella offers a substantial amount of coverage for your open-air space. 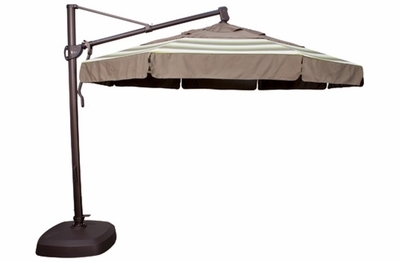 At 11', this umbrella easily shelters a very large dining area or your lush deep seating set next to your pool. This high quality umbrella is both sturdy and durable designed to endure from season to season. A variety of fade resistant colors are available to coordinate beautifully with any outdoor decor. The convenient foot pedal allows you to rotate the canopy with ease and it also tilts at 18, 36 or 54 degree angles giving you the versatility you desire. With this upscale outdoor umbrella you and your guests will have it made in the shade. * Weight: DWV: 88.0 lbs DWV w/optional Valance: 89.0 lbs.